Many Cuba observers have mentioned that there will be no transition to a market economy in Cuba until Cuba’s current leadership passes away either physically or politically. This observation has served as an undercurrent in a variety of forums ranging from foreign policy position papers1 and think tank publications2 to more accessible publications such as novels,3 magazines,4 and even television commercials.5 Missing in all these media have been a quantification of how long will the current leadership remain in place, and what is the likely result of waiting for its demise on the Cuban economy. This article will establish a framework for answering both of these questions by first defining a probabilistic survival model for the current leadership, and then using it to establish an actuarial model using demographic and economic assumptions. Actuarial models are designed to produce estimates of the expected value of one or more economic variables that are distributed in a random manner. One such model assumes that the value of an economic variable is dependent on the survival or demise of individuals or objects. Examples of these are actuarial models that are used to determine present values of future payments contingent on the survival status of individuals such as pensions or life insurance benefits. Making a particular economic variable dependent on the survival status of the current Cuban leadership, and making the leadership’s survival status a random variable dependent on time elapsed, defines an actuarial model for that economic variable. Some economic variables that can be modeled in this manner are: the relative size of the Cuban economy, the expected value of expenditures such as economic aid or government outlays, and the average Cuban GDP per capita. The value of each of those variables is assumed to depend on the survival status of the current Cuban leadership. The expected curtate-future-lifetime at age x can be used as an estimate of the future lifetime of an individual who has attained age x. Death is assumed to occur on or before the attainment of the next future year of age. If the time of death is distributed uniformly throughout the year, the expected lifetime is known as the complete-expectation-of-life and it can be approximated by ex+½. where f(∞,n) is the value of the economic variable n years in the future assuming that leadership has survived to that date. An actuarial model can be based on a discrete random variable survival model and a set of economic and probabilistic assumptions. The principal assumption is the probability survival function. This model can easily work with a probability function that defines the leadership survival in terms of quantifiable economic, political, or social variables. Nonetheless for illustrative purposes, it will be assumed that the leadership survival will be linked only to the physical survival of the leader or of members of the leadership. Furthermore it will be assumed that the leadership will survive as long as one member of the current or original leadership is alive. The choice of an appropriate survival function can be debated ad nauseaum but for the illustrative purpose of this paper, two mortality tables previously used by the author will be assumed. 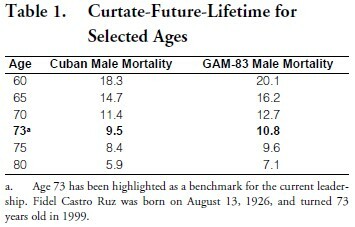 The first mortality table has been derived by the author from Cuban published sources.8 It has been previously used to project the Cuban male population, and to model the Cuban social security system. The second mortality table is commonly known as GAM-83 for Males, and it is widely used in the United States for pension valuation. The two mortality tables are reproduced as Table I and Table II, respectively, of the Appendix for ages 25 and older. The GAM-83 mortality table assumes a greater longevity than the Cuban Mortality table. This difference decreases with age as can be observed from Table 1, and Tables I and II in the Appendix. The economic assumptions of the actuarial model will be defined depending on the type of economic variable one is modeling. For illustrative purposes, this paper will show the result of modeling two types economic variables: annuity payments, and the relative values of macroeconomic amounts. Annuity payments consist of annual payments that will continue as long as the current leadership survives. Examples of annuity payments are the expenditures related to the maintenance of the security apparatus around the leadership, or U.S. federal budget outlays related to countering or influencing the current Cuban leadership. The relative value of macroeconomic amounts is measured against the absolute value of those amounts at some point in time. An example of this economic variable will be the Cuban gross national product as a multiple of its value in 1999. Another such variable is the GNP lost due to waiting for the leadership’s demise before transitioning to a more dynamic, growth-oriented economic system. Annuity payments are annual payments that will continue as long as the leadership survives. The expected total value of these annuity payments can be calculated from formula (3) where f(t) is the accumulated value of those payments at time of death. If the annuity payments are constant over time (i.e. f(t)=kt where k is the first year payments), their expected total value is equal to one year’s payment times the expected future lifetime of the leadership. If the annuity payments are assumed to commence on the date of the calculation, i.e. f(t) = k(t+1), then their expected value is equal to one year’s payment times the expected curtate-future-lifetime plus one year. where g(t) is the annuity payments made in year t.
Based on formula (7) we can define an annuitizing factor as E[f(Tx)]/g(0) which when multiplied by the initial annual payment results in the expected value of all future payments. Tables III and IV of the Appendix show the annuitizing factors for some representative expenditure growth rates for each single age 25 and older. The annuitizing factors increase with the payment growth rate, and they decrease with the age of the leadership. In the absence of any competing goals, anyone benefiting from annuity payments contingent on the survival of the current Cuban leadership benefits from both the increase in the amount of those payments, and the longevity of the leadership. Table 2 shows the annuitizing factor for some representative growth rates and ages. The annuitizing factors in Table 2 show that the expected accumulated value of annuity payments is greater than the accumulated value of annuity payments paid during the expected curtate-future-lifetime. This is due to the finite probability of surviving the expected curtate-future- lifetime, and receiving payments afterwards. where γk is the GNP annual growth rate in year k.
For small γ0, and γ1, equivalent scenarios can be defined by the difference γ1 – γ0. This simplifies the numerical modeling to calculating the scaled loss for a few scenarios defined by the difference γ1 – γ0 rather than modeling each possible combination of the GNP growth rates γ0, and γ1. The Ultimate GNP loss is defined as the expected value of the GNP loss as n → ∞. It is a measurement of the permanent GNP loss because of waiting for the passing away of the current leadership before transitioning to a more growth-oriented economy. Because Tx is a discrete random variable with a probability function that becomes null at a finite future age, the ultimate GNP loss can be easily calculated equal to the expected GNP Loss at the last age with a non-zero survival probability. This last age is age 100 for the Cuban Male Mortality table, and age 110 for the GAM-83 Male Mortality Table. 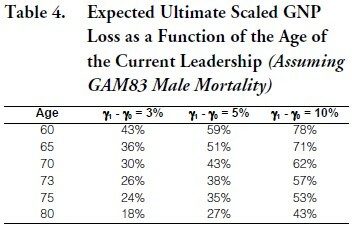 Table 3 shows that Ultimate GNP loss is dependent on the assumed leadership mortality, but that effect is overshadowed by the impact of the difference in GNP growth rates during and after the current leadership. 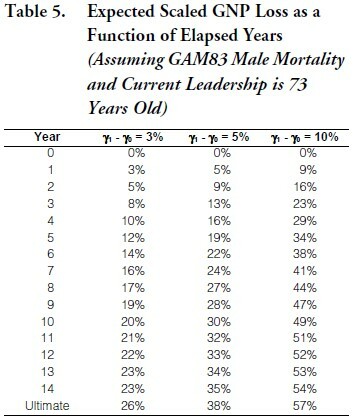 Table 4 illustrates that the expected Ultimate GNP loss decreases with the assumed age of the leadership. This is due to the increased mortality associated with older ages and the resulting quicker transition to a post-leadership GNP growth scenario. Table 4 also shows that an increase of one year in age results in a decrease of between 1.25% and 1.75% in the ultimate Scaled GNP loss but that is easily overshadowed by an increase of 1% in the difference of GNP growth rates during and after the leadership. As shown in Table 5, the GNP loss grows to its ultimate value relatively fast reaching 50% of the ultimate level in 4 to 5 years, and 90% of its ultimate value within 13 years. The size of the difference in GNP growth rates during and after the current leadership accelerates the rate at which the expected GNP loss reaches its ultimate value. All of these illustrations assume that the transition to a more dynamic growth-oriented economy will commence immediately after the current leadership passes away. The expected GNP loss will increase if a delay is introduced in the start of the post-leadership growth rates. Conversely, if one assumes that the transition to the higher GNP growth scenario commences before the leadership passes away, the expected GNP loss will be reduced. An actuarial model of the impact of waiting for the passing of the current Cuban leadership will be highly dependent on the survival function assumed for the leadership. This paper has limited itself to modeling one possible political transition scenario: no change will occur until the current leadership dies. One can argue that the current leadership is subject to risks that may warrant the use of a more aggressive mortality table. Nonetheless in the absence of any empirical evidence supporting this assertion, a general population mortality table appears to be the most appropriate assumption for the survival function of the current leadership. The illustrative examples in this paper were based on individual survival models. Collective survival functions can also serve as the basis for an actuarial model. Collective survival functions can be established such that the current leadership is considered to have survived as long as one member of the collective is alive, or if the members of the collective pass away in a certain chronological order. These survival models can be built based on individual mortality tables and the demographic characteristics of the leadership. Assuming that the leadership will survive as long as any member is alive will have the result of increasing the longevity of the leadership, and the relative size of the annuitizing factors, and the Ultimate GNP loss. The expected value of the ultimate GNP loss can be used to support an argument for the immediate transition to a market economy even if this transition is likely to result in some short term contraction of the economy. As long as the size of that immediate contraction does not exceed the expected Ultimate GNP loss, it can be argued that the Cuban economy is better off in the long term. The only justifications for maintaining the current leadership under these circumstances can be found in political and social arguments, which are outside of the scope of this paper. A thorough discussion of the gap between the GNP growth rates under the current leadership, and the post-leadership GNP growth rates is also outside the scope of this paper. It should be pointed out that the growth rates could be assumed to be random variables. Such a model requires the establishment of probability distribution for the GNP growth rates during and after the current leadership. An actuarial model can serve as a powerful tool for quantifying the effect of survival of individuals, organisms, objects, and processes. In the case of the Cuban economy, it has been applied to show the likely impact on the Cuban economy of waiting for the current leadership to die. 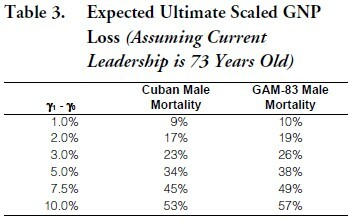 The model presented here shows that waiting for the current leadership to pass away before transitioning to a more dynamic, growth-oriented economy will likely result in lasting losses to the Cuban economy that will be realized during the expected lifetime of the current leadership. 1. Council on Foreign Relations, Independent Task Force (Bernard W. Aronson and William D. Rogers, Task Force Co-chairs 1999), U.S.-Cuban Relations in the 21st Century. New York: Council on Foreign Relations, 1999. 2. Gonzalez, Edward. Cuba’s Dismal Post Castro Futures. Santa Monica, California: RAND, 1996. 3. Cruz Smith, Martin. Havana Bay. New York: Random House, 1999; Patrick, Vincent. Smoke Screen. New York: William Morrow, 1999. 4. Putnam, John J. “Cuba: Evolution in the Revolution” National Geographic Magazine (June 1999). 5. Solomon Smith Barney. What will happen in Cuba after Castro is gone …? TV Commercial aired in the United States, 1998-1999. 6. Bowers, Newton L. Jr., Hans U. Gerber, James C. Hickman, Donald A. Jones, Cecil J. Nesbitt. Actuarial Mathematics. Itasca, Illinois: The Society of Actuaries, 1986. 7. Bowers, Gerber, Hickman, Jones and Nesbitt. Actuarial Mathematics. 8. Donate-Armada, Ricardo A. “Cuban Social Security: A Preliminary Actuarial Analysis of Law #24 of Social Security.” Cuba in Transition—Volume 4. Washington: Association for the Study of the Cuban Economy, 1994.